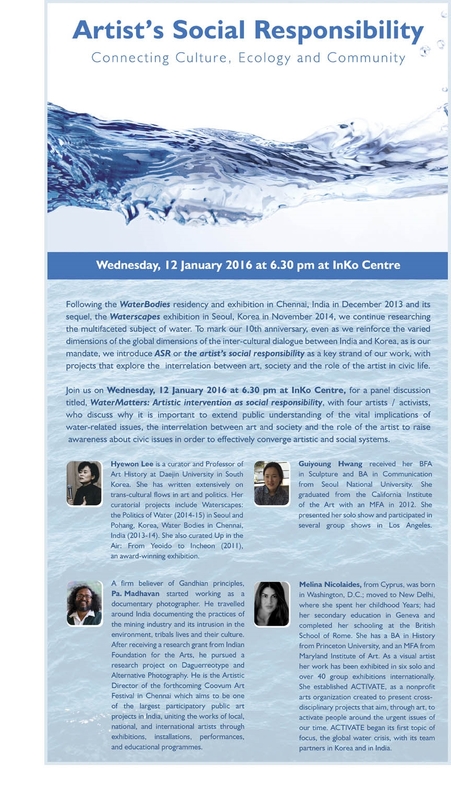 “In continuation of the Inko Centre’s engagement in projects related to water - the Water Bodies residency and exhibition in December 2013 and its sequel, the Waterscapes exhibition in Seoul, Korea in November 2014 - we have invited three committed water activists/artists to Chennai to participate in our proposed ongoing research on the multifaceted subject of water. The recent unprecedented rains and subsequent flooding of the city with the Cooum River breaching its banks, only adds to the urgency of such research to try and find tangible, sustainable solutions in terms of river restoration, preservation, sound civic planning and infrastructure development. Our water-related projects have always aimed to connect Culture, Ecology and Community through the contributions of artists, activists, the media and the citizens of Chennai. In light of the water-related events of recent times within our region, our 2016 projects will have a special focus on the topic of water and on the artist's social responsibility in deepening this dialogue in a sustained and meaningful manner. The forthcoming research project will aim to raise awareness about the Cooum to change peoples’ understanding and perspective of this river. We hope that the findings of this project could be shared effectively with relevant stakeholders in the city and with the organizers of the forthcoming Coovum Art Festival (CAF) that is scheduled for a future date in Chennai, India. In an interview by the Daily Thanthi Next, entitled “State of Cooum is a Reflection of Society”, the four artists/water activists discussed why art must lend its voice to the dialogue on global issues such as climate change, and also inspire people to be active regarding important local issues such as the restoration and cleaning of the water bodies of our cities. They also talked about how events such as the InKo Centre’s Water Matters - an artistic intervention towards social responsibility - contribute to and encourage artistic initiatives that promote environmental awareness, understanding of ecosystems in relationship to people; and tackle difficult topics such as how the state of a city’s rivers and its other water bodies can be regarded as a reflection of its society. The objective of all such initiatives is to illustrate how all of us have a role to play in the state of our surroundings, in accepting accountability, and finally in taking ownership to keep all water bodies clean and healthy. Hyewon Lee is a curator and art history professor at Daejin University in South Korea. She has written extensively on trans-cultural flows in art and politics. Her curatorial projects include Waterscapes: the Politics of Water (2014-15) in Seoul and Pohang, Korea, Water Bodies in Chennai, India (2013-14), A Room if his Own: Masculinities in Korea and the Middle East (2014) in Seoul; Gohan-Sabuk Project (2009) for a former mining valley in the east coast of the Korean peninsula and An Online Public Art Project for Seoul (2007). She also curated Up in the Air: From Yeoido to Incheon (2011), an award-winning exhibition of various objects and artifacts that South Koreans brought home from their overseas travels from the time of Vietnam War to the first decade of the 21st century. Mapping a society which has been in a constant process of defining and redefining itself in terms of the "Others" under the frenzy speed of modernization/ industrialization, this exhibition aimed to reveal the weight of intangible burden that they have carried--an aspiration for becoming world citizens in routes that shifted as the world system itself underwent changes. Hyewon Lee believes in art as social practice and her projects have mostly been inspired by her own lived experience of everyday. Guiyoung Hwang was born in 1983 in Masan, South Korea and received her BFA in sculpture and BA in communication from Seoul National University. She graduated from the California Institute of the Art, MFA in 2012. She had a solo exhibition at Commonwealth and Council in Los Angeles and participated in group shows including "Authenticity" in 2012, "Hexenhaus" in 2013 in Los Angeles; "2014 Multimedia Festival-Hi Squirrels" in 2014, Daegu, South Korea. Hwang's practice consists of fieldwork and performative interventions in urban landscape. Recording her activities through photographs, dialogical documents and videos, Hwang uses various forms of mimicry and erasure to address the plasticity of subjectivity in between the sectors of the private and the public in contemporary cityscapes. PA. Madhavan, a firm believer of Gandhian principles, started working as a documentary photographer, travelled around India documenting mining industry and its intrusion in the environment, tribals lives and their culture. After receiving a research grant from Indian Foundation for the Arts, he pursued a research project on Daguerreotype and Alternative Photography. He was a consultant with Plan International, Save the Children, Christian Children Fund, and DFID for photography. Presently he dedicates his entire time to Goa Center for Alternative Photography (Goa-CAP) doing research, curating shows and promoting alternative photography in South Asia. PA Madhavan is the Artistic Director of the forthcoming Coovum Art Festival which aims to be one of the largest participatory public art projects in India, uniting the works of local, national, and international artists through exhibitions, installations, performances, and educational programmes. Melina Nicolaides, originally from the island of Cyprus, was born in Washington, D.C. With her family, she moved to New Delhi at the age of seven, where she spent her childhood years, followed by secondary education in Geneva, and completion of her studies at the British School of Rome. She has a BA degree in History from Princeton University, obtained with the thesis "A problem of Authenticity and Representation in a 19th century Vision of the Orient" as considered through Verdi's opera 'Aida'. Following an extended training-period in Brussels at the E.U. in the sectors of communication, information and cultural heritage, she went on to receive a multi-disciplinary MFA from Baltimore's Maryland Institute College of Art (MICA), attended with an A.G. Leventis Foundation Graduate Fellowship, and where she earned the institution's 1997 Graduate Award in Painting. As a visual artist her work has been exhibited in six solo and over 40 group exhibitions internationally, and can be found in public and private art collections in the USA, Europe, and the Middle East. She has received multiple governmental and institutional art and exhibition grants (painting, film, installation) in Cyprus and the USA, and her work has been reviewed in diverse publications such as The Washington Post, Art News Magazine, Contemporary Practices Arts Journal Dubai. Following a recent move to live in her homeland of Cyprus for the first time, she established ACTIVATE which began its engagement with its first topic of focus – the global water crisis – with its team partners in India and Korea. Alongside the research project on water launched by the InKo Centre in January 2016, were a series of other initiatives around water that were taking place in the city of Chennai. Many of these initiatives were organized by fellow artists and colleagues whom we knew personally, and others with whose past work on water-issues we were well acquainted. One of these initiatives was PA. Madhavan’s I AM HERE project that began on 14th of January 2016 (Pongal day) at the banks of Cooum River (opposite Radisson Blu hotel at the Ethiraj Road, Egmore), and lasted through the morning of the 17th as a solo marathon performance of 72 hours in which the artist combined art and activism by fasting along the river effort to get people talking about the Cooum in whatever medium possible. Just as for thousands of years all over the world fasting has been practiced as a religious ritual to a potent political weapon, Madhavan aimed to use the Gandhian method of activism Fasting as a social intervention instrument, while also practicing his own art - Pinhole Photography. He also invited other artists to come and sit next to him, to read books together, talk about everything on earth, and to have a small stroll along the river. As explained in the artist’s mission statement, this performance is performed out of love for the river which Chennai has forgotten. This love for the river is without any prejudice, opinion, or judgment; only dedicated to the beautiful river Cooum which is no longer visited by people and rather hated and ignored by the citizens of Chennai. This performance was a continuation of the artist’s WALK ALONG THE RIVER initiative in which he led a group of artists to walk along the river Cooum for 9 days to interact with the landscape. The walk was intended to demonstrate the relationship between river and people, and as an artistic social project with the aim to bring all genres of artistic and social media together to experience the river ecosystem. and the need to clean and restore the Cooum River in Chennai. As part of the four major projects of the first Chennai Photo Biennale (February 26 - March 13, 2016), jointly organised by Goethe-Institut and city-based photographer Varun Gupta (under his organization Travelling Lens), was the workshop entitled Urban Water that was held from January 9 to January 17 at the Goethe-Institut in Chennai. Following the recent Chennai floods, this initiative aimed to bring this issue to center stage and provide a forum in which to reflect on the chain of events that led to that catastrophe. The central theme of the Urban Water Workshop, in which photographers and artists working with the photographic medium participated, was to explore the various problems and realities that surround the water situation in Chennai, and the immeasurable importance of water bodies. The workshop was led and mentored by Ravi Agarwal photographer and activist from Delhi, and Munem Wasif (Bangladesh). The 15 participants were expected to create a body of images around a particular theme as visual dialogue surrounding water-related issues in Chennai. The work would be put together as an installation on urban water to be exhibited during the photo biennale at the Light House MRTS, curated by photographer Andreas Deffner (Germany-Pondicherry). Some of the themes chosen included residue along the coast; waste piled up on the riverbanks; stories related to the ocean and rivers flowing through the city; the livelihood of fishermen. In an article entitled “Urban Water and its Meaningful Study” in the New India Express, Ravi Agarwal said: “The idea is to understand the water situation in and around Chennai.” Commenting on the construction and development-planning of the city, “even cities that were logically planned, are now more-or-less illogical.” When asked what subject he would have chosen to explore, he shared: “I would look at how water is networked in the city. Water, as it is fluid, always connects to something, creating an entire network from rivers, lakes, estuaries to pipes and taps. When we disrupt this network, disaster takes place.” The Photo Biennale opened 26 February 2016. An evening on the roof of the Goethe-Institut in Chennai on 13 January 2016 with the Urban Water Workshop organizers, participants and other water activists & artists, arranged to preview and discuss the regional water issues raised by the photographers’ workshop projects.